Nick did a very cool post about where you could download free DIY paper plans for various Star Wars ships, I’ve just had an email from Robert of Smidigt to share with us that there are also plans for the various characters, they’ve got Stormtroopers, Boba Fett and of course Vadar himself. The models do look a bit tricky to make but I’m sure that’s half the fun. 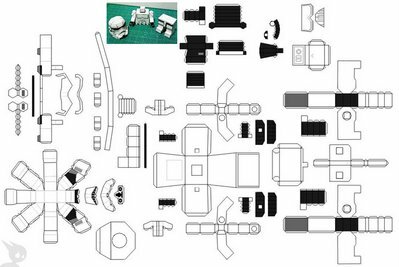 This sort of model making papercraft is known as pepakura which basically means making cool stuff using paper, scissors and glue. Plans: Stormtrooper, Boba Fett, Clone Trooper, Commando CT and Darth Vader. Found via Smidigt and ToysREvil, thanks guys. Wow…it`s very funny to build them…I got a lot of them finished…. Awesome! By the way, what kind of paper did you use?